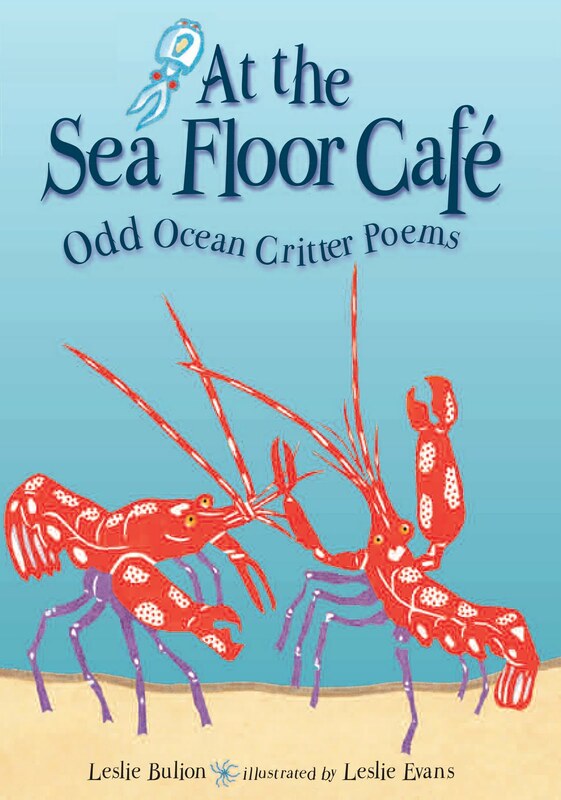 At the Sea Floor Café: Odd Ocean Critter Poems, written by Leslie Bulion and illustrated by Leslie Evans, is a collection that contains 18 poems, a helpful glossary of scientific terms, poetry notes that describe the form of the poems, and suggestions for additional resources. Did you know that Bulion has a graduate degree in oceanography? That means you'll find poetry and science--a perfect pairing in my opinion--that are nicely matched in this collection. Here's a poem about an octopus. And wraps the other six around its top. And thus avoids become shark-chewed slop. A coconut that strolls across the ocean floor. Poem © Leslie Bulion. All rights reserved. The poems in this collection are accompanied by factual information. Here's the text about the coconut octopus. The coconut octopus wraps six of its arms around its head and walks backwards on its other two arms. This movement makes the octopus look like a coconut drifting across the shallow sea floor near Indonesia. Predators hunting for an eight-tentacled snack pass on by. This is just the type of book I enjoying sharing with my preservice teachers. The blending of poetry and informational text makes this a good choice for teachers attempting to to integrate children's literature into the content areas. If you want some additional information on ocean life, here are just a few resources you may find useful. DLTK's Crafts for Kids has some ocean animal activities. Treasures at Sea: Exploring the Ocean Through Literature is a teaching unit that includes games and puzzles, writing activities, book recommendations, art activities and more. The Fish FAQ from Woods Hole Science Aquarium has answers to just about any question you might have about fish and other ocean animals. The round up this week is being hosted by Jama at Jama's Alphabet Soup. Do stop by and take in all the terrific poetry being shared. Before you go, be sure to check out this week's poetry stretch results. Happy poetry Friday all! I agree -- what could be better than a combination of poetry and factual scientific information? Love the octopus poem and the Monterey Aquarium! Nice! Reminded me a little bit of Jon Scieszka and Lane Smith's Science Verse. Always great to have a blending of science/math and poetry. An unlikely marriage - but they seem to complement each other beautifully. Looking forward to my third science poetry book, coming soon: RANDOM BODY PARTS: Gross Anatomy Riddles in Verse. Poetry Stretch - It's Never Too Late! Tuesday Poetry Stretch - What Makes You Smile?